Many cities and towns internationally want to be known as green communities. The benefits of sustainable transportation, renewable energy, recycling, clean water, urban tree cover, and the like certainly help to make a more livable community and help to hold global climate change at bay. In the process of going green, communities also grow new industries for the local economy, improve public health, create hope for their citizens, and polish their image, which in turns helps to attract new investment. There is no shortage of quality resources to help your community get started and to gain insight about how to put your own local twist on sustainability. As a first positive step, many municipalities are appointing a green citizens' commission or sustainability committee. What stops most cities and towns from joining in on the trend is that they may perceive that being green or sustainable represents a huge effort, an uphill battle, and a fight not important to the general public. Actually that's a reasonable guess, but it's proving to be incorrect. If your community seems reluctant, point out that some measures taken by green communities can be simple in concept, relatively inexpensive as municipal projects go, and extremely cost effective. For example, in Philadelphia, where the horticultural society had a strong planting program before green was so stylish, Professor Susan Wachter's research showed that planting trees on vacant lots led to significant appreciation (more than 30 percent) in the value of adjacent lots. Philadelphia Greening has taken the art of planting trees and installing a uniform fence around vacant lots to a new level of neighborhood stabilization. We find the STAR Communities division of topics, rating guide, certification program, and technical materials to be fairly practical, and we suggest that your sustainability commission look over those resources as you start your local work. Their website includes reports from their certified communities. (Approach this and all certification programs with healthy skepticism, but often they motivate local action.) This non-profit organizations represents collaboration among large non-profits, the National League of Cities, and foundations. Cities internationally join one of the STAR Communities partners, ICLEI Local Governments for Sustainability, and mayors sign the U.S. Conference of Mayors climate protection agreement. Large cities will want to read the research and think about the methodology behind the Green City Index, which has completed studies of cities in Asia, Europe, and Latin America. Adding safe off-street bicycle and walking paths through parks, unused street or utility rights-of-way, vacant lots, commercial or industrial developments (especially if empty), and flood or disaster buy-out land. Making it easy to build mixed-use development and transit-oriented development, as well as cluster housing, also known as conservation subdivisions. Requiring density, thereby reducing the need for, and increasing the efficiency of, roads, utilities, and everything linear (Yes, we know it's controversial; maybe you can use the green communities angle to push through something that would not have been seriously considered before.) In particular there is an opportunity to add considerable density along major streets without impacting single-family subdivision very much. For more on this idea, see our YIMBY page. Requiring or stiffening requirements for a riparian buffer by streams, rivers, creeks, drainage ditches, or whatever you call them. ("Riparian" simply means pertaining to water. "Buffer" is a term for space allowed for transition in uses.) In this case, a riparian buffer would provide vegetation that would filter out pollutants and slow down the stormwater runoff as rain or snow melt enters water bodies. Requiring permeable pavement for new parking lots ("permeable" means water can soak into it). Requiring low-impact development techniques in parking lots; for example, the tree island between parking rows could be V shaped instead of higher than the parking lot, thus allowing the runoff to flow into the space between the rows and be filtered rather than immediately running off the lot. Pausing here for a moment, we see that these first four legislative measures for green communities fall within the traditional boundaries for municipal land use regulation. The connections among these measures are explained in a recommended book, Green Metropolis: Why Living Smaller, Living Closer, and Driving Less Are the Keys to Sustainability. As this book points out, many popular and trendy sustainability measures are fairly pointless unless you address root causes and impacts of a scattered development pattern and therefore more driving of personal automobiles. Encouraging or requiring energy-efficient and water-efficient fixtures and appliances in new construction (probably through adopting an energy conservation code, both in your building code and existing building code if you have one). Addressing particular ways in which climate change might impact your community, whether that is increased risk of flash flooding, sea level rise, more frequent severe storms in general, expanding floodplains, greater use of air conditioning, new challenges for agriculture, need to decrease water use for landscaping, or whatever is appropriate. For some more discussion on sustainability in general but climate change in particular, see our interview on sustainable cities. Often municipal governments are slow to implement these green communities measures simply because staff members don't have time to research the solutions. Let's face it. In some areas, such as renewable energy, the technology is changing quickly and many unproven techniques are out there. So a busy municipal official may put that brochure about natural gas powered vehicles on the stack to be read someday if there's ever time. But the municipal sustainability committee, whatever it may be called, can help to research some of these things. They can talk with salespeople, contact other municipalities, and even go on field trips to see what others have done. They can set up peer-to-peer conversations so their government officials don't have to feel as though they are taking the recommendations of citizens without any professional input. Internet research is key to making the job of the sustainability committee bearable. Making lists of what others have accomplished can be very helpful. If your city or town decides it wants to be a green community, the investment in an ICLEI or other membership can be worthwhile. It provides a tool for measuring the community's carbon footprint, and with college intern power it can be implemented over a summer. Then of course a few summers later, you can see your progress and get everyone excited again about participating in the green communities movement. Note that LEED, a program of the U.S. Green Building Council and an acronym for Leadership in Energy and Environmental Design, now has developed a certification for neighborhoods or whole developments, rather than the single buildings for which LEED certification of meeting "green" requirements is most noted. A very helpful source of information for you as a community leader or activist can be found in the downloadable publication A Citizens Guide to LEED for Neighborhood Development. This publication will stir up ideas for you even if you know in advance that pursuing the LEED-ND certification is too expensive or cumbersome for the project or existing neighborhood you have in mind. For communities in the U.S., area-wide projects to help residents and organizations become greener is a pleasant challenge, because on this topic municipalities often have been ahead of state governments and definitely ahead of the federal government in grasping a concept and running with it. 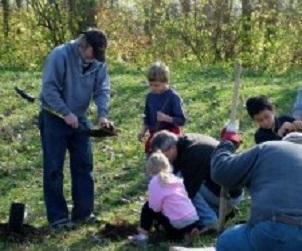 In all parts of the world, many activities of community organizations and non-profits could help your city become known as a leader among green communities.